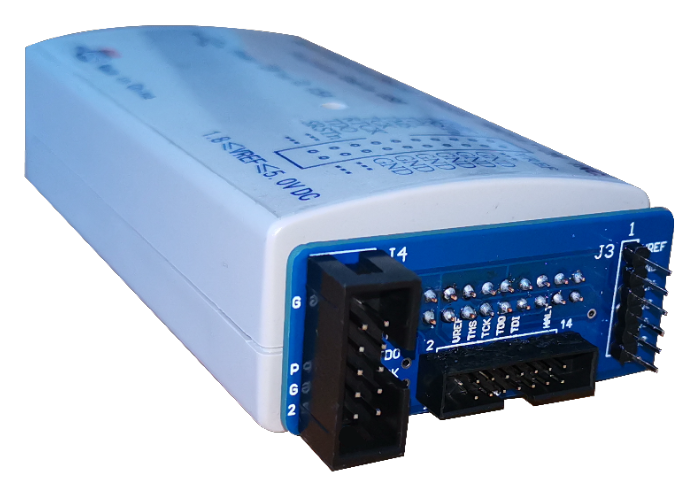 High speed USB 2.0 interface to local server. Dimensions 10.2x5.4 mm (2×1.6″) , Adapter plate （6pin， 2x7pin 2.54mm,15 cm (8″) 2×10 JTAG cable , 1×6 JTAG cable , 2×7 JTAG cable ribbon cable are included. 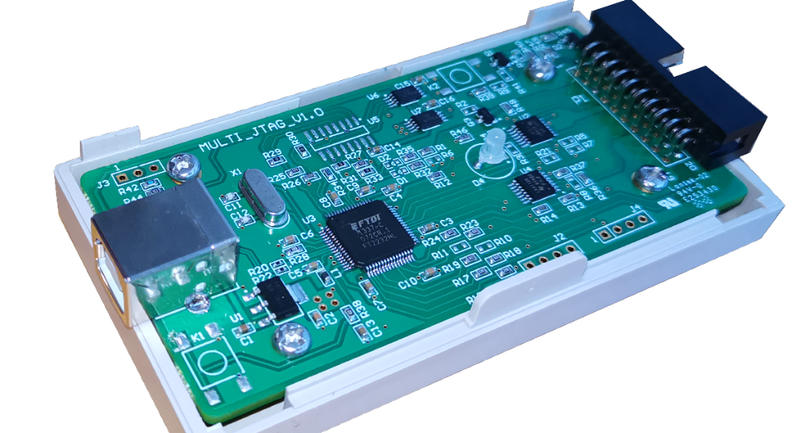 TCK – Test Clock: The test clock pin on the JTAG interface is the clock signal used for ensuring the timing of the boundary scan system. The Test Clock is used to load the test mode data from the TMS pin, and the test data on the TDI pin on the rising edge. On the falling edge test clock outputs the test data on the TDO pin. It is important that the clock line is properly terminated to prevent reflections that may give rise to false triggering and incorrect operation of the JTAG interface. 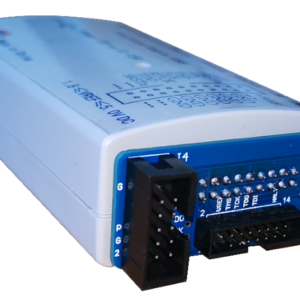 TDI – Test Data Input: The TDI pin on the JTAG interface or JTAG connector is the connection onto which the test instructions data stream is passed. It receives serial input data which is either feed to the test data registers or instruction register, dependent upon on the state of the TAP controller. The TDI line has an internal pull-up, and therefore the input is high with no input. 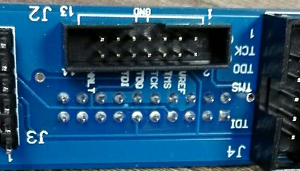 TDO – Test Data Output: This pin within the JTAG interface provides data from the boundary scan registers, i.e. test data shifts out on this pin. It delivers serial data which comes from either the test data registers or instruction register, dependent upon on the state of the TAP controller. Data applied to the TDI pin will appear at the TDO pin but may be shifted by a number of clock cycles, depending on the length of the internal register. The TDO pin has a high-impedance. TMS – Test Mode Select: This input on the JTAG interface also clocks through on the rising edge of TCK determines the state of the TAP controller. It controls the operation of the test logic, by receiving the incoming data. The value at the input on the rising edge of the clock controls the movement through the states of the TAP controller. The TMS line has an internal pull-up, and therefore the input is high with no input. 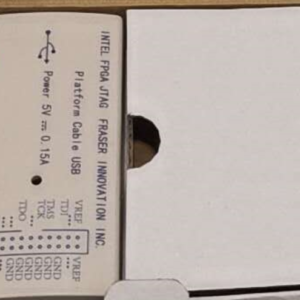 TRST – Test Reset: This is an optional active low test reset pin on the JTAG interface. It permits asynchronous TAP controller initialization without affecting other device or system logic. The TRST signal is usually asynchronous, but not always so dependent upon the particular device in question. A JTAG interface is a special interface added to a chip. Depending on the version of JTAG, two, four, or five pins are added. 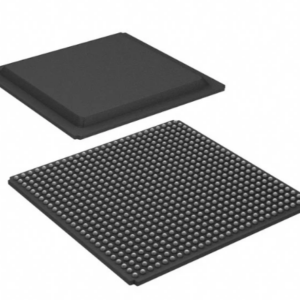 The four and five pin interfaces are designed so that multiple chips on a board can have their JTAG lines daisy-chained together if specific conditions are met. 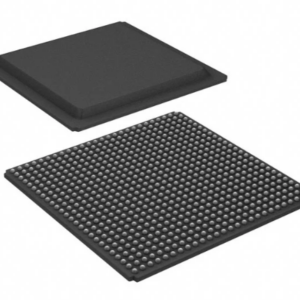 The two pin interface is designed so that multiple chips can be connected in a star topology. In either case a test probe need only connect to a single “JTAG port” to have access to all chips on a circuit board. The TRST pin is an optional active-low reset to the test logic, usually asynchronous, but sometimes synchronous, depending on the chip. If the pin is not available, the test logic can be reset by switching to the reset state synchronously, using TCK and TMS. Note that resetting test logic doesn’t necessarily imply resetting anything else. There are generally some processor-specific JTAG operations which can reset all or part of the chip being debugged. 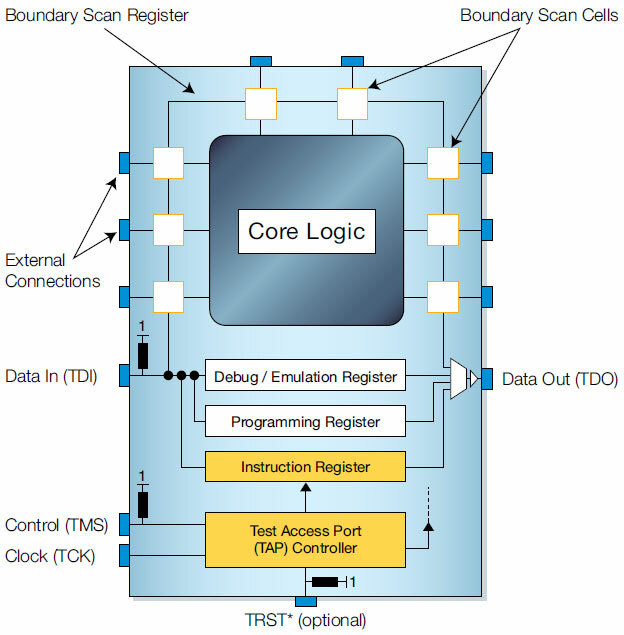 ARM architecture processors come with JTAG support, sometimes supporting a two-wire “SWD” variant or high speed tracing of traffic on instruction or data busses. Almost all FPGAs and CPLDs used today can be programmed via a JTAG port. 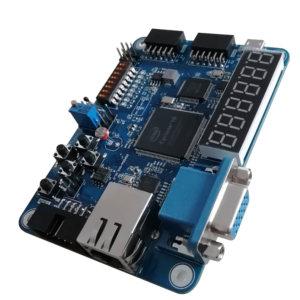 A Standard Test and Programming Language is defined by JEDEC standard JESD-71 for JTAG programming of PLD’s. Boundary scan testing and in-system (device) programming applications are sometimes programmed using the Serial Vector Format, a textual representation of JTAG operations using a simple syntax. Other programming formats include ‘JAM’ and STAPL plus more recently the IEEE Std. 1532 defined format ‘ISC’ (short for In-System Configuration). 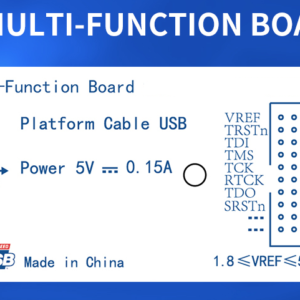 ISC format is used in conjunction with enhanced BSDL models for programmable logic devices (i.e. FPGAs and CPLDs) that include addition ISC_<operation> instructions in addition to the basic bare minimum IEEE 1149.1 instructions. 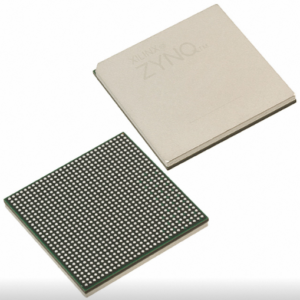 FPGA programming tools from Xilinx, Altera, Lattice, Cypress, Actel, etc. typically are able to export such files. Those connectors tend to include more than just the four standardized signals (TMS, TCK, TDI, TDO). Usually reset signals are provided, one or both of TRST (TAP reset) and SRST (system reset). 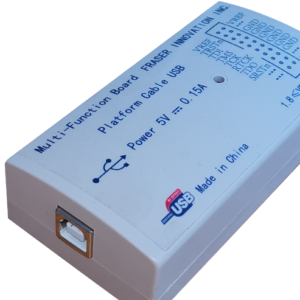 The connector usually provides the board-under-test’s logic supply voltage so that the JTAG adapters use the appropriate logic levels. The board voltage may also serve as a “board present” debugger input. Other event input or output signals may be provided, or general purpose I/O (GPIO) lines, to support more complex debugging architectures.